I love teaching and to be honest most days Tractor Man loves learning. But, there are days where learning for him is on the back burner. To be honest some days it’s not even in the kitchen or if it is, it may possibly already be going up in smoke. I have a very stubborn, opoinionated, strong-willed choleric child. To be honest I think I may have two but with Tag Along it is to soon to tell (I hope). But I also have a very strong-willed, compassionate, determined to help child. The problem is that his heart is in the right place but it can get him in trouble too. Like when the dog comes to beg food at meal time. Tractor Man will slip him food if he can but then is agast when there is none left for him to eat. Plus the mood he gets into when the dog later tries to take food from his hand. Lately he has been fed up with learning. That is putting it lightly. We have been forced to do all of his school in the morning because by 1pm he is in shutdown mode. Head down, rolling around, whining “I can’t”, done for the day mode. We have done story time then, but sometimes even that is a lost cause. This new fed up with learning ideal of his is not one that I want to be a normal thing. Breaking the habit that it seems to have become is even harder than I had anticipated. So, here is our new game plan to get him back into learning. Create Excitement: One thing that young children can not seem to turn away from is excitement. If it looks fun and sounds fun then it must indeed be fun. ( Oh, to be young again where that was all it took to try something new.) I am taking all of the key things he needs to know and making them more exciting. Counting practice is more fun with live animals and M & M’s. Learning to count money is better with the real thing. Purchasing something on his own is the best lesson for him to learn, hands on. Fractions? Try making cookies or pie! Games and Creations: We have implimented craft time now as well as game time. 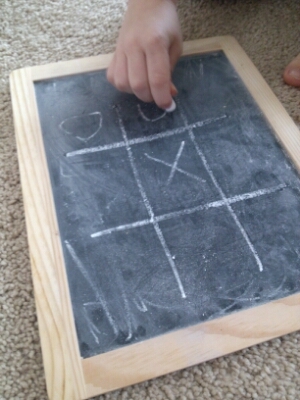 Tic-Tac-Toe is now a MUST that we do after every math lesson is complete. Plus, it helps him to practice his x’s and o’s, which is writing practice as well. In the summer we will be doing the old fashioned hop scotch. Let him drive: Take this one within reason. First, NO I do not mean to actually let him drive (Tractor Man is only 4 after all). This is ment to help you direct the learning back to your child’s interests. There is no sense forcing him to learn about the history of Motzart if he is more inclined to like the history of agriculture in the United States. Yes, your child still needs to learn basic skills but writing practice can be a list of words they want to know. Letters are repetative so any practice is good practice. Reading falls into the same category (we are reading My Side of the Mountain). Counting can be done anywhere at anytime, so do it! Patience and Flexibility: While I know that the above steps are being taken to encourage and get him back into love of learning mode, I also know that nothing is perfect. Staying patient and being flexible are things that I must remember to do. Some progress daily is better than none at all. As long as we keep moving forward he has a lifetime to learn. And really he and I are both learning something new everyday. Stay calm and it will all work out. Remember though that flexibiltiy does not mean to stop all education but rather to curb lessons toward your childs’ interests and attention span. In an ideal world our children would never tire of the things we want to teach them and we would have all the answers for their questions. The reality is that we really don’t. Teaching your child is a challenge. Learning is a challenge. Making the best of it, in my opinion, is one of the biggest challenge of all. As you implement these four basic things into your teaching plans let them serve as a gentle reminder that none of us are made the same. Embrace this difference and do your best to grow with your child. Home schooling is lots of hard work, but I know you can do it.